This easy bhatura recipe with yeast and yogurt needs no overnight fermentation and you can prepare the bhatura dough quickly and make the bhaturas in a couple of hours time. 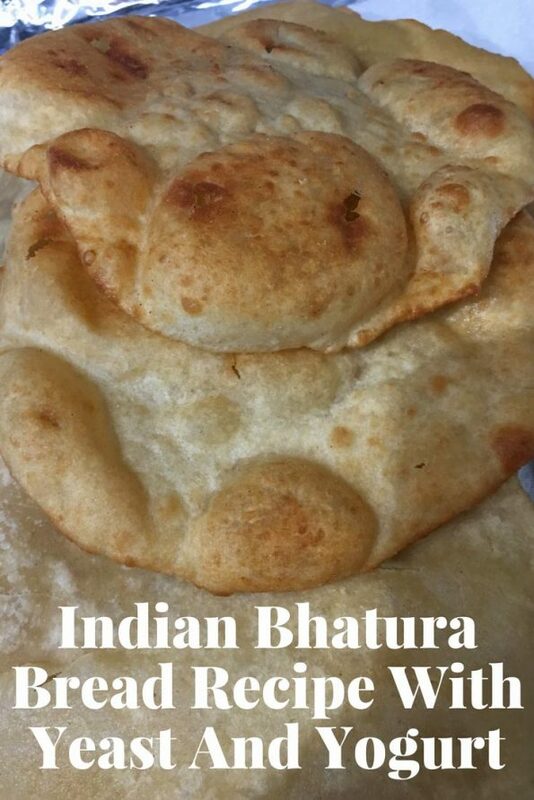 In this recipe, we have step by step instructions for bhatura dough recipe for making homemade bhatura bread from scratch. Many bhatura recipes call for overnight fermentation which is the traditional way of making bhaturas, but I almost always makes bhaturas this way and it tursn out delicious. You can start making the bhatura dough by almost evening or in the afternoon so you can easily make the bhaturas quickly for dinner. Punjabi bhaturas are popular deep fried Indian flat breads which is most known for its combination with chole or chana masala (chickpea curry). You may also enjoy bhaturas with any other vegetarian curry of your choice, although chole or chana masala is the most popular combination for bhaturas. 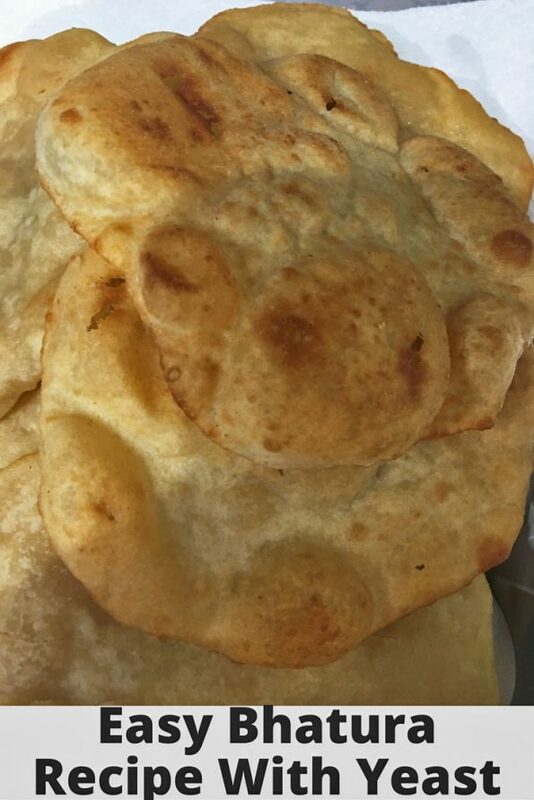 See my blog post here on how to make soft chapathis which are popular and commonly available Indian flatbreads. You can also use one of these side dishes for chapathis, which you can enjoy with bhatura. If you want to enjoy it something really simple, you can also use fresh yogurt or raitha (yogurt based salads) which is a simple but awesome combination with bhatura, poori or chapathi. I used a mix of unbleached all purpose flour and wheat atta flour (flour used to make Indian flat breads like chapathi), you may also make this using just all purpose flour if you wish (by replacing wheat atta flour with all purpose flour) although mixing with wheat atta flour is thought to be more healthy due to the increased fiber content. So here is how you can make instant (it takes a couple of hours though), quick and easy bhaturas following this easy bhatura recipe with yeast and yogurt. This Indian Punjabi style fried flatbread is eggless and made using yeast and yogurt. It is acperfect side dish for lunch or dinner along with rice and chole masala (chana masala) for a delicious meal, or you can enjoy this for breakfast as well. In a large bowl, mix together the all purpose four, wheat atta flour and salt. In another small bowl, mix together warm water and yeast. Add sugar to the yeast mixture and keep this mixture covered for about 10 minutes until the yeast dissolves. After 10 minutes when the yeast is dissolved very well,mix the yeast mixture using a spoon and transfer the yeast mixture to the dry flour mixture. Mix the contents using your hands, you will get a crumbly textured flour mixture. In a bowl, mix the yogurt very well to avoid any lumps. Add the beaten yogurt to the flour mixture and mix well with the dough. Add the 1 tablespoon oil to the dough and knead well using the hands to form the dough ball. The dough is supposed to be little sticky, but if it is too sticky, you may add a few spoons of all purpose flour and knead well. Keep this dough covered for about an hour. For best results, preheat the oven to 350 degree Fahrenheit for about 2 to 3 minutes, once the oven is slightly hot, switch off the oven and put the dough inside the heated oven. Make sure to use an oven safe bowl for keeping the dough, I usually use an oven safe steel bowl. Also make sure not to use very hot ovens, just we need to give a warm atmosphere to make the dough rise fast. Every oven has slightly different temperatures, so if your oven is too hot, wait for it cool down and while it is still warm inside(but not too hot) keep the bowl of dough inside. Let bowl of dough sit inside the warm oven for about an hour. After an hour, you can take the bowl out, open the bowl, and you can see that the dough is risen and almost doubled in size..
Gently press the dough with your hands, cover the bowl again and let it rise for another one more hour. You do not need to keep the dough again in oven. After two hours in total, the dough should be ready! Make little large sized balls from the dough, if its sticky, you may roll the balls in little flour and then roll the balls for making the bhaturas. You can roll them little thick and large as bhaturas can be large sized. Heat oil in a large frying pan or kadai and gently transfer the rolled bhatura dough to the hot oil. 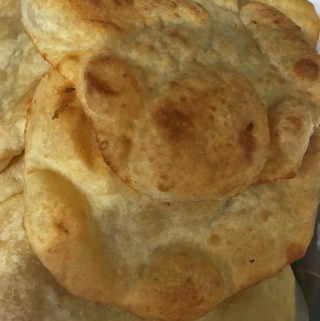 You can deep fry the bhaturas until both the sides are lightly browned by gently flipping over. If you fry for a long time, they can become hard, so just fry until its lightly brown and cooked. Make balls out of the dough until all dough is finished and roll them and fry all bhaturas one by one as instructed above. Keep the fried bhaturas in a paper towel which will absorb any excess oil.Serve the delicious hot bhaturas with chole (chickpea curry) or any curry as you wish! Keep the fried bhaturas in a paper towel which will absorb any excess oil. Serve the delicious hot bhaturas with chole (chickpea curry) or any curry as you wish. If you are not serving the bhaturas right away, I recommend keeping them closed so they will remain soft. If you are preparing the bhaturas in the evening, you may not need to refrigerate them if you are using them for next day breakfast, just keep it closed in an air tight container and they will be fine and soft (unless its very hot weather). 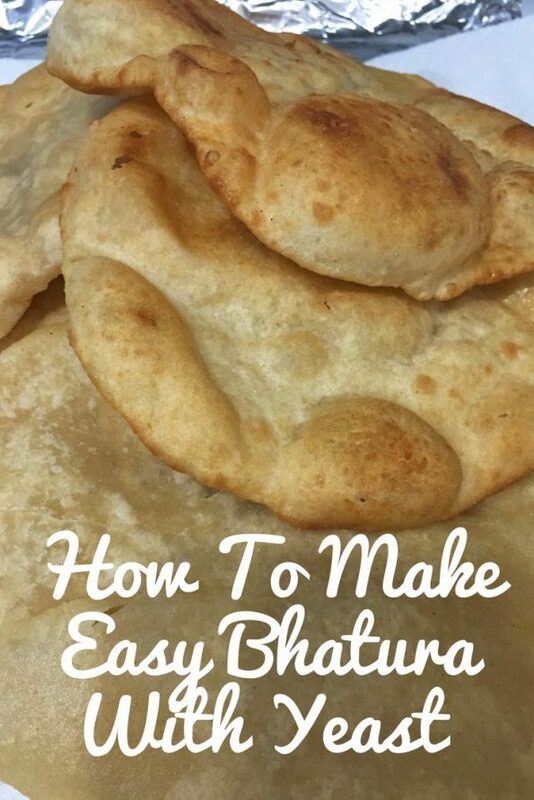 Hope you found this post on bhaturas helpful in making and easy and yummy bhaturas for breakfast or dinner!